Smoking and tobacco use are significant risk factors for a variety of chronic disorders. According to Centers for Disease Control Prevention, cigarette smoking causes about one of every five deaths in the United States each year, accounting for over 480,000 deaths each year. About 8.6 million people in the US have at least one serious illness caused by smoking. Smokers die significantly earlier than non-smokers: 13.2 years for men and 14.5 years for women. Smoking is a major cause of atherosclerosis – a build-up of fatty substances in the arteries. Atherosclerosis occurs when the normal lining of the arteries deteriorates, the walls of the arteries thicken, and deposits of fat and plaque block the flow of blood through the arteries. In coronary artery disease, the arteries that supply blood to the heart become severely narrowed, decreasing the supply of oxygen-rich blood to the heart, especially during times of increased activity. Extra strain on the heart may result in chest pain and other symptoms. Cigarettes have multiple poisons, including addictive nicotine, carbon monoxide, tars, and hydrogen cyanide. There are 7000 other chemicals of varying toxicity, including 69 known to cause cancer. Many people remember hearing about the difference between smoker’s lungs and normal healthy lungs at some point in time. These changes occur on a visual level, on a cellular level under the microscope, and even on a molecular level. In addition to these structural changes, there are several functional differences between healthy lungs and smoker’s lungs as well. 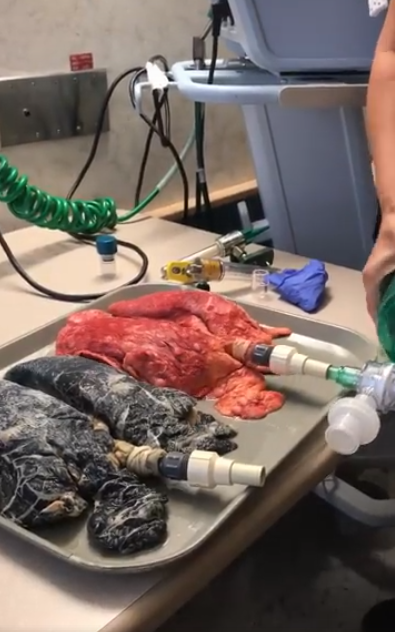 To really comprehend the effect of tobacco smoke on the lungs, we need to take a look at both the anatomy—how the appearance of the lungs changes, and the physiology—how the function of a smoker’s lungs differ from those of healthy lungs. It is very simple. A person who has never smoked a cigarette in his life will have a red-colored lung and a smoker will have a black or a brown colored lung. 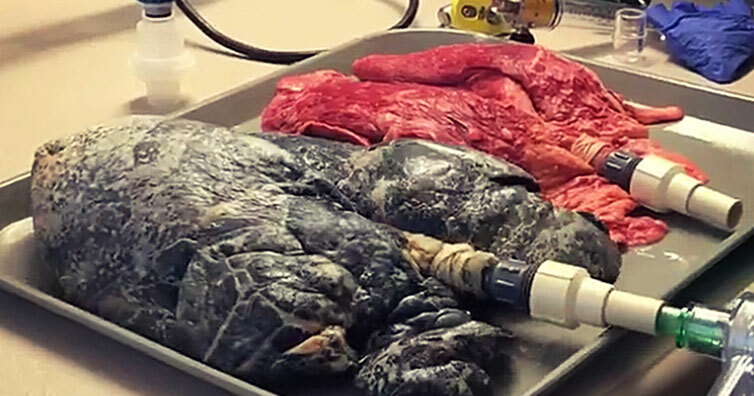 It is very easy to visually differentiate between a smoker’s lungs and a non-smoker’s lungs. However, it is important to state that not all black lungs are related to tobacco smoke. Other irritants that can be inhaled may cause this appearance as well, such as the black lung disease sometimes seen in coal miners. Yet, it’s very easy to tell when looking at a set of lungs whether or not a person smoked during his life. When you inhale cigarette smoke, there are thousands of tiny carbon-based particles that are inhaled. Our bodies have a special way of dealing with these particles to get them out of the way if you will. This gives the black or brown color to the lungs. Smoking also has an effect on the functions that are carried out by the lungs. It decreases the duration of deflation by the lungs and it also makes the heart much more inelastic. The lungs’ primary role is to bring in air from the atmosphere and pass life-giving oxygen into the bloodstream; from here, it can be circulated to the rest of the body. Lungs have no musculature of their own, and so the mechanics of breathing are reliant upon the muscles of the diaphragm (to which it is attached), the intercostals muscles (between the ribs) and the muscles of the abdomen and neck. As the diaphragm relaxes and returns to its resting position, the volume of the lungs decreases, causing a pressure increase that expels the air. The toxic substances that a person inhales while smoking reduce the above functioning of the lungs causing less intake of oxygen. In fact, smoking doubles your risk of having a heart attack, and if you do smoke, you have twice the risk of dying from coronary heart disease than lifetime non-smokers. The body is very good at repairing some of the damage to lung cells and tissues caused by smoking, but not all of the damage is reversible.